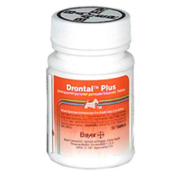 Shop for dewormers for dogs at VetDepot.com. Whipworms, which are thin at one end and thicker at the other, take their name from their whip-like appearance. Adults grow to 2 to 3 inches long in the intestines. Residing primarily at the end of the small intestines and the beginning of the large intestines, whipworms secure themselves to the intestinal wall where they feed on the host's blood. A small infection often causes no visible symptoms, but larger quantities of this intestinal parasite can cause bloody or mucoid stool, diarrhea, weight loss, intestinal inflammation, bleeding into the intestines, and anemia and associated symptoms, including pale gums and mucous membranes, lethargy, and progressive weakness. Puppies may have stunted growth and a coat lacking in luster. "To prevent whipworm infection, puppies and adult dogs should follow a regular worming schedule." While some common intestinal parasites are contracted in a variety of ways, a whipworm infection mainly comes from ingestion of food or water contaminated with eggs. After the eggs hatch, it takes about three months for the larvae to mature into adults. Diagnosing a whipworm infection is a bit harder than discovering other common internal parasites, such as roundworms, hookworms, and tapeworms. The reason for this is twofold: adults rarely appear in the stool and the females lay far fewer eggs than many other worms and at less frequent intervals. This often means eggs will not be found in the stool without multiple and frequent samplings. Two to three treatments with an appropriate worming medication are generally needed to eradicate a whipworm infection. Multiple doses are usually necessary because of the difficulty of attaining adequate drug concentrations in the colon. Effective products for ridding dogs of whipworms include Panacur, Advantage Multi, and Drontal Plus. Intestinal inflammation and anemia stemming from a whipworm infection may also require treatment. Anti-inflammatory agents can help with the former, while increased protein and iron intake can remedy the latter. If a dog becomes severely anemic (more likely in a young puppy), a blood transfusion may be needed. To prevent whipworm infection, puppies and adult dogs should follow a regular worming schedule. 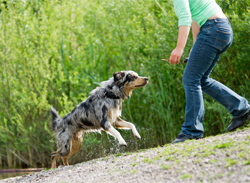 Your veterinarian can recommend a particular product and design a regimen based on your dog's individual risk factors. Also, clean up your dog's stool immediately after a bowel movement, whether it occurs in your own yard, during a walk, or at a park or other public place. This helps protect your own pet as well as the others in your neighborhood. Infections can be persistent because eggs remain viable for up to five years in the ground.